Some people have unusual friends, but they love them just the same. Mr. Putney is one of those people; his friends are not only unusual, they’re downright strange! off. 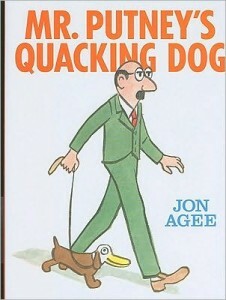 Mr. Putney’s Quacking Dog, by author Jon Agee, is loaded with imagination and animal fun. There is, of course, a quacking dog, but there’s also an Alarmadillo (an Armadillo alarm clock) a Soctopus (an octopus with cold feet), and even a Goruler (a gorilla that measures height). Mr. Putney’s Quacking Dog, is a fun and clever book, and uses a question and visual clue format so children have no trouble identifying such things as clangaroos (a kangaroo with cymbals on its hands), or Mr. Putney’s sloppy lunch friend – the slobster (a sloppy lobster). Doesn’t this book sound like fun? You bet, and it is also full of hilarious photos to keep you laughing for days! So whatever you do, don’t miss out on Mr. Putney’s Quacking Dog.